As a senior, you must decide where you’re going to retire. South Korea is an exciting and modern option that many Western retirees consider. Whether you’re a Brit, an American or an Australian, South Korea is a dream destination if you’re into technology, culture and new experiences. Though it’s not a cheap country, you can get by using your pension, know-how, and a little creativity. 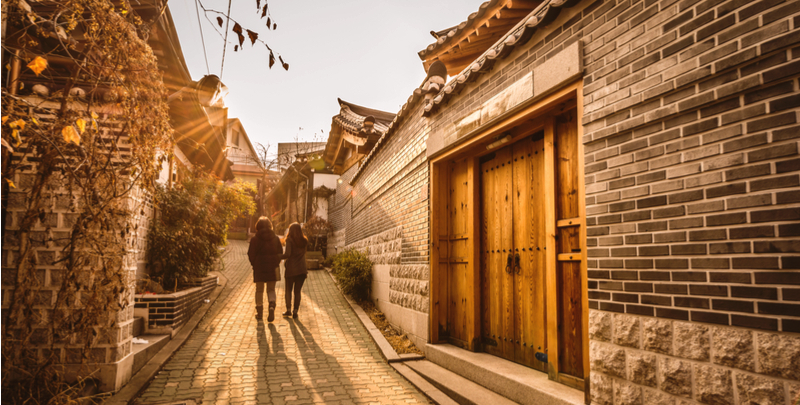 Here’s everything you’ll need to know about pursuing your South Korean adventure. What's the cost of living like in South Korea? South Korea is home to some of the more expensive areas in the world, especially its capital, Seoul. Getting by financially is easier if you have a lot of savings, or if you have great ways to save on currency exchange. One way is through TransferWise, which you can use to transfer money into a South Korean local bank account and save on international tariffs. TransferWise uses the real exchange rate and applies a low fixed fee - leaving you with more money to enjoy your retirement. How much money do I need to retire in South Korea? Many expats will tell you that no matter your budget, you should be able to get by in South Korea. However, if you’re planning to live cheaply, you need to be very careful of how you budget. If you are spending less than 2,000 USD/2,266,160 KRW a month, you should plan to skip dining out, traveling or saving any money. You will not be able to afford a car, but should probably rely on public transportation. If your budget is somewhere between 2,000 USD and 3,000 USD, or 2,266,160 KRW and 3,396,000 KRW, you can retire comfortably. Although this is a fairly modest salary, you can plan to go out to dinner, take the occasional trip and even own a car. Between 3,000 USD and 4,000 USD a month, or 3,396,000 KRW and 4,527,600 KRW, you should be able to live comfortably and put aside some savings. Above this amount, you can live generously, and expect to comfortably support a family. If you’re looking to buy property in South Korea, expect to pay about 805,756 ₩ per square foot. Lending rules were recently tightened by the South Korean government, but there’s a large supply of housing. The cities of South Korea, where most people live, have some of the world’s highest population densities. The capital city, Seoul, is home to 10 million people. The climate is humid during the summer and cold and dry during the winter. Average temperatures in July are 24°C (75°F) and -4°C (25°F) in January. You definitely won’t miss the seasons if you retire in South Korea - you’ll find a range of temperatures and weather depending on the season. Many tourists enjoy visiting in spring or autumn, when the climate is pleasant and moderate. South Korea is best geared toward retirees with an adventurous side. You can find food you wouldn’t normally eat in other parts of the world; things like blood sausage, chicken feet, pork skin and raw sea worm. If you’re not into being culinarily adventurous, there’s plenty of delicious bibimbap, bulgogi, kimchi and lots of international food you’d find in any global city. You’ll find a thriving expat community in cities like Seoul and Incheon. So if you’re game for cultural meetups, historical excursions to museums and landmarks, or outings with shopping buddies, you’ll find it in South Korea. Outside of the cities you’ll find areas with great natural beauty. Koreans and expats alike enjoy visiting hot springs and exploring traditional eastern medicinal practices. What are the best places to retire to in South Korea? Seoul is South Korea’s capital. Here you’ll find the country’s largest concentration of expats. Violent street crime is very rare there, but because of the high tourist concentration, you may run into a pickpocket or two. Seoul has endless museums, restaurants and a thriving nightlife. It’s also a global shopping capital. Busan is the second-largest city in South Korea. It’s a large port city with a laid-back feel. The city is home to three major beaches, and is known to be very safe for foreigners and residents alike. There’s no shortage of festivals and cultural events. Cheonan is a city that links to Seoul on the subway. It’s a university city and also hosts headquarters of many global technology companies. It’s lively and has every modern convenience, but allows you to escape a little bit of the bustle of Seoul. Incheon borders Seoul. However, it has its own distinctive feel - there’s a golf course and a casino and a large fish market that hosts many tours. You can access several islands and beaches from Incheon. Geoje Island rests off the southern coast of South Korea. On it, you can explore mountains, coves and beaches. Smaller adjacent islands are wonderful for exploring, and you can feel like you’ve truly escaped from the world. However, the island is connected to the mainland by bridges and a bus will get you to Busan. To live in Seoul, you’ll need a visa, no matter the duration of your stay. The best way to settle in South Korea is by applying for an alien registration card. You’ll have 90 days after arrival to apply for this card. If you become a long-term visa holder, you’ll eventually be able to apply for residency in South Korea. To achieve residency, you’ll need language proficiency, knowledge of Korean history, five years of proven residence, and to pass an interview and written test. You can go to Seoul for up to 90 days without a visa. After that, you’ll have to apply for an alien registration card, as detailed above. You can visit South Korea without a visa if you’re planning a maximum stay of three months. After that, you should apply for the alien registration card, as detailed above. It may not be the easiest place to retire to, but South Korea is an exciting and dynamic place to call home. You’ll find fellow expats, adventure buddies and a host of new experiences.